The 2017 Classic is over but we’re still buzzing from all the impressions and fun that we had. A huge thank you to all participators, spectators and helpers for making this event special! The planning for the next Classic Regatta has started already and we’re looking forward to welcome everyone back at our little harbour. For those who missed it, here’s the Regatta Report by Bill Sandberg, Racing Director. Founded in 1992 by the Glandore Harbour Yacht Club to pay homage to the classic sailing yachts of Ireland, this year’s Classic Regatta event attracted 80 entrants. Starting off the week was the traditional ‘Parade of Sail’ led by the Baltimore RNLI. Following closely behind was Michael O’Donnell’s Big Momma which also served as the committee boat for the week. Other boats included George McGruer’s beautiful 17m planked ketch Cuilaun; Patrick Dorgan’s Elsie, one of the oldest boats in the event, designed by William Fife and built in 1896; visiting yachtsman Thomas Drewes’ 7.3m work boat Jane Paul; Dr. Michael Brogan’s MacDuach, which is the oldest of the Galway Hookers built during the 1970s revival of the class and an assortment of other classics as well as Dragons, Squibs and Ettes. 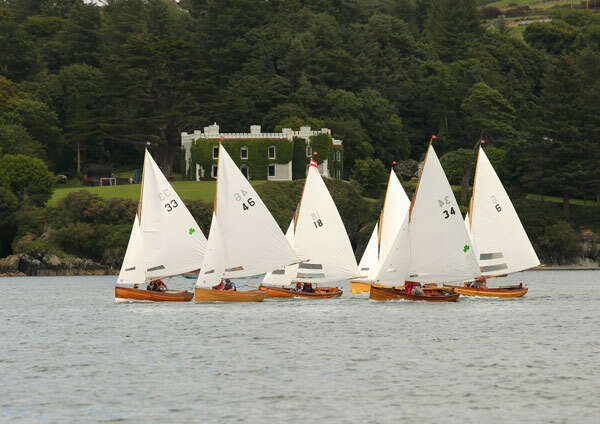 Making a return to the Glandore Classic was the fleet of Water Wags, brought from Dublin by Regatta veteran, Hal Sisk. The Water Wag is the oldest one-design dinghy in existence, having been devised in 1886 and formalised as a one-design class in 1887. The Water Wag inspired similar one-design fleets around Ireland and subsequently around the world. The Water Wags thrilled the crowd with their synchronised sailing performance led by Water Wag Club Captain, Hal Sisk. The weather was beautiful for most of the week, however the Wind Gods sent winds ranging from 0 to 35 knots, so the winning crews had to prove their ability in a wide range of conditions. 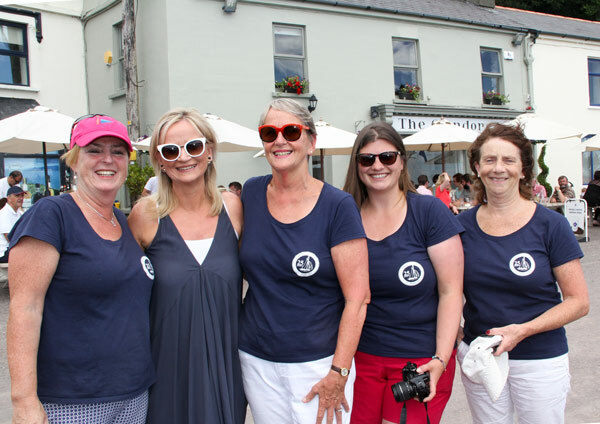 Another tradition of the Glandore Classic Regatta is the ‘Cruise in Company’ to Castletownshend, complete with a palate-pleasing lunch at Fergus O’Mahony’s, Mary Ann’s Bar and Restaurant. Nearly 60 competitors enjoyed the lunch accompanied by a pint or two (or three!). Racing was divided into two fleets. The Bay Fleet comprised of larger offshore boats and the Harbour Fleet was made up of one-designs. The racing was hotly contested with some classes being decided by just one point. In Class One, Cuilaun led the way with seven points (including three first places) followed closely by Elsie (older boats still perform well) and Joe Hamilton’s Freya. Owen Sisk, sailing Emmanuel led the way in Class Two, with Jane Paul and Conor O’Hanlon’s Glennmiller following closely behind. Aphrodite, led the fleet with 11 points. 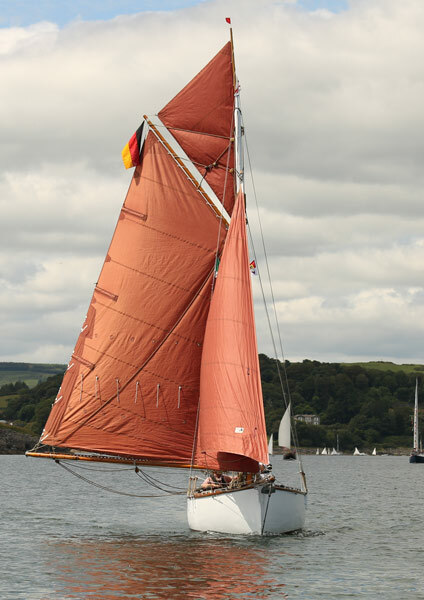 Former Commodore, Maeve Cotter’s Serafina was one point behind and in third place was yet another former GHYC Commodore, Diarmuid O’Donovan aboard Pongo. Of course no Dragon race in Glandore Harbour would be complete without local sailing legend, Don Street, steering his wooden Gypsy built in 1933. This year, Don celebrated his 87th birthday with his usual Heineken in hand and surrounded by his family who flew in to help mark this momentous occasion. The Squibs class was won by visiting sailor Pat Simpson from Norfolk at the helm of Penny B, followed closely by the local Squib-sailing hotshot, Dave Sheahan, steering Too Dee. Third place was taken by Joe O’Byrne at the helm of Femme Fatale, probably the oldest Squib in Ireland. Honours in the Ette Class went to yacht builder Rui Ferrara aboard Sagette. Classic Dinghies was won by Jens Franke’s Goldenwind and Gary O’Sullivan’s Haven walked away with victory in the Day Boat fleet. mention. Sally was ably assisted by her husband, John Wyles. The Race Committee was led by USA’s Bill Sandberg serving his third regatta as PRO as well as local race officers, John and Ann Williams who run more than 160 races per year. The committee boat and support boat were manned by junior sailors and many other members. Michael O’Donnell, back for his second regatta, was kind enough to provide his boat, Big Momma, as the committee boat for the week. Mal Nolan once again served as offshore mark boat. Finally, no event of this magnitude can run without the generosity of sponsors. Cantor Fitzgerald led the way as the major sponsor. Other primary sponsors were Fehily Timoney, Cork County Council, CH Marine, Glenmar Shellfish, McCarthy Insurance and Dubarry of Ireland. Several generous ‘Friends of the Classic’ chose to remain anonymous. Smoked Fish, Pilgrim’s Restaurant and the Outdoor Discovery Adventure Company. Community support was provided by Casey’s Bar, Glandore Inn, Glandore Bistro, Hayes’ Bar and Restaurant and Drimoleague Vintage Car Club, Union Hall Community Development Association and Myross Rowing Club. Special sailing support was provided by Michael O’Donnell, Hal Sisk, Hugh Cassidy, Union Hall RNLI, Baltimore RNLI and Gary McMahon. Special guest presenters were Dee Forbes, Director General of RTE, Bill Stafford and Pat Tanner. An additional highlight of the week was the appearance of Jack Roy, recently elected President of Irish Sailing. It is Mr. Roy’s intention is to visit as many sailing venues as possible, and the inclusion of the Glandore Harbour Classic Regatta was a logical choice. 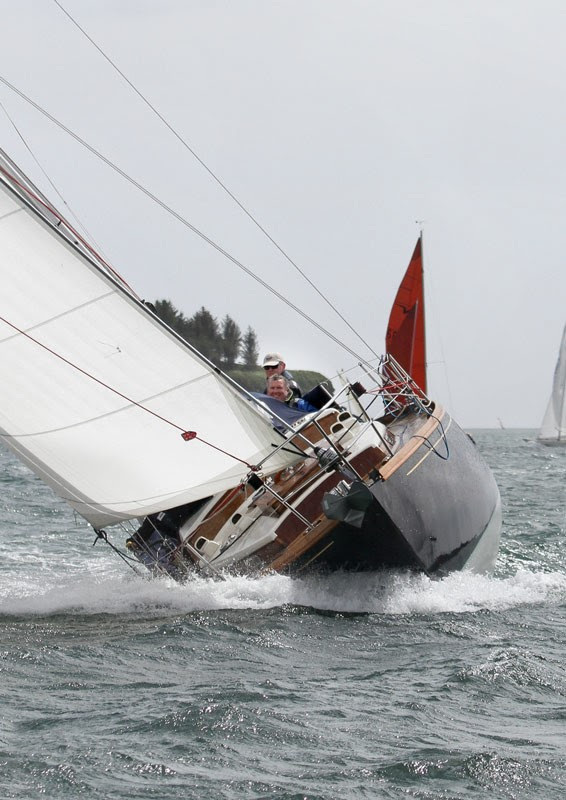 The 2019 Glandore Classic Regatta will be held the third week of July. For additional information, check the club’s website at www.glandoreyc.com. We’re getting spoilt by Afloat with another great article mentioning the Classic Regatta. Read here. Irish Etchells 22 Transformed Into International Classic: This beautiful ‘new classic’ will be in Glandore for the Classic Regatta. Come and hear Bill Trafford tell us how he did it. Welcome to the 2017 Glandore Classic Regatta. 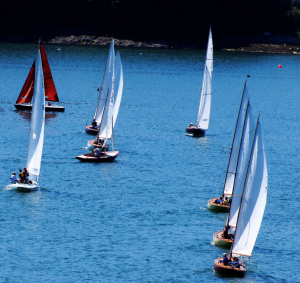 Glandore will be the place to be from 23-28th July this year if you are interested in Classic boats, great racing, or just having a good time in the most beautiful harbour in Ireland. This page contains news updates and information about the 2017 Classic, and about visiting Glandore. 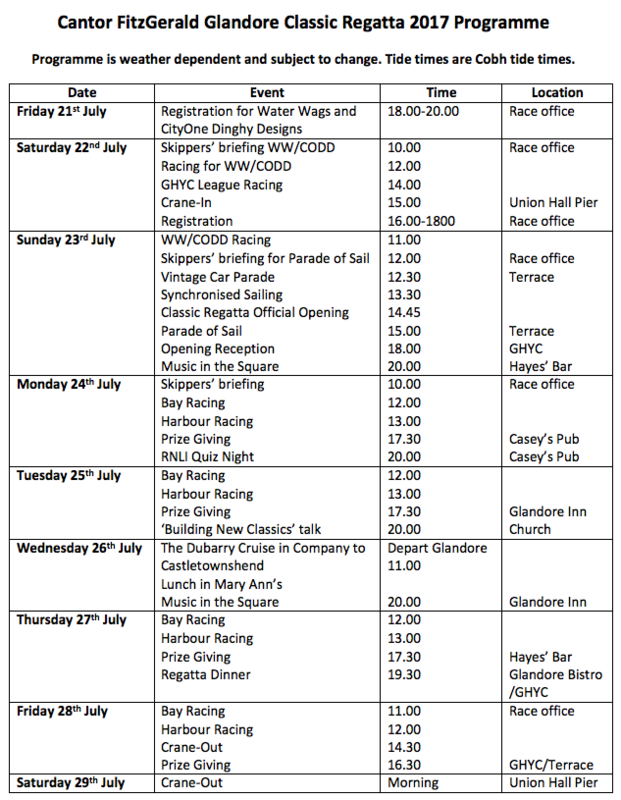 Please also see the pages for the Notice of Race, Registration and Payment, Provisional Programme, Accommodation and Classic Boats (articles on boats that have sailed in previous Glandore Classic Regattas). Pages containing Sailing Instructions, and Racing results will be added later. The Glandore Classic is always a great week, but our 25th anniversary year will be extra special. We are pulling out all the stops to ensure the anniversary is a great success, combining the usual excellent racing with lots of opportunities to admire beautiful boats, and a variety of shore side activities. The programme will highlight the different classes of classic boats racing in the harbor, as well as the very popular ‘cruise in company’ to Castletownshend, and the nightly entertainment in our wonderful pubs and restaurants. But to celebrate the anniversary we are adding several new features, on and off the water. Around the theme of ‘upcycling old classics’, we will have the chance to see and learn about some of the best examples of both restored and upcycled classic boats. Then there will be classic cars, classic movies, and classic stories, not to mention the Food Stalls serving classic West Cork food and drink. Guided walks will allow the non-sailors to explore the beautiful coastal views around Glandore, including the famous Drombeg Stones, and boat trips around the harbor will provide a unique of view some of our most beautiful old houses. For those interested, the village of Union Hall just across the harbour is the home base for whale watching, deep sea fishing, and sea kayaking. Registration is now open. You can register and pay on-line (note, the payment process starts after you submit your registration form), or you can print out the form and send it in by mail with a cheque. For those of you not familiar with Glandore, read on to see why you should come and join us. 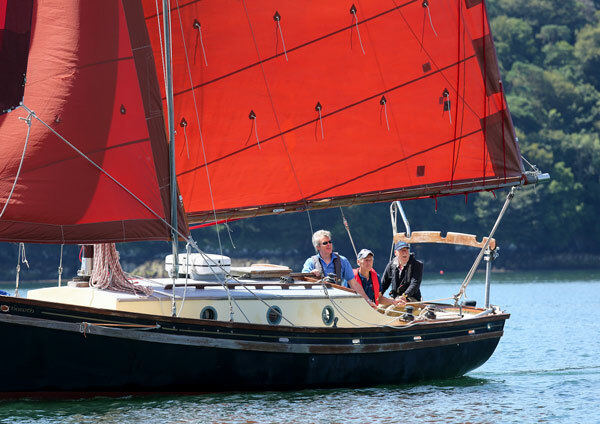 The 25th Anniversary Glandore Classic is shaping up nicely, with lots of beautiful, interesting boats all set to compete. The highlight may well be the a.k. Ilen, which will sail into Glandore on her first sea voyage after her major renovation at Hegarty’s boat yard in Oldcourt. Other beautiful boats that have confirmed their participation include the two the 1898 Fife Brynoth, Cork Harbour One Design Elsie and Airlie, Spirit of Oysterhaven, Celtic Mist, Síle a Dó, Molly Bawn, Big Momma and the 1954 Watson designed Niamh Lua, built as the lifeboat for Shannon Airport, and lovingly converted by Hugh Cassidy. In addition to the usual exciting racing, there will be a demonstration of syncronised sailing by the Dublin based Water Wags, and a parade of vintage cars thanks to the Drimoleague Vintage Car Club. There will be food trucks and stalls to help keep the cost of feeding visiting families down, as well as BBQ facilities in our new club yard. For the non-sailors there will be lots of fun activities, kayaking, whale watching, sea fishing, guided walks, and of course the usual evening music, dancing and pub-based craic. Please do register now and we will get information that will help us plan even better racing for you. Enjoy this wonderful article about our upcoming Classic Regatta by Afloat. 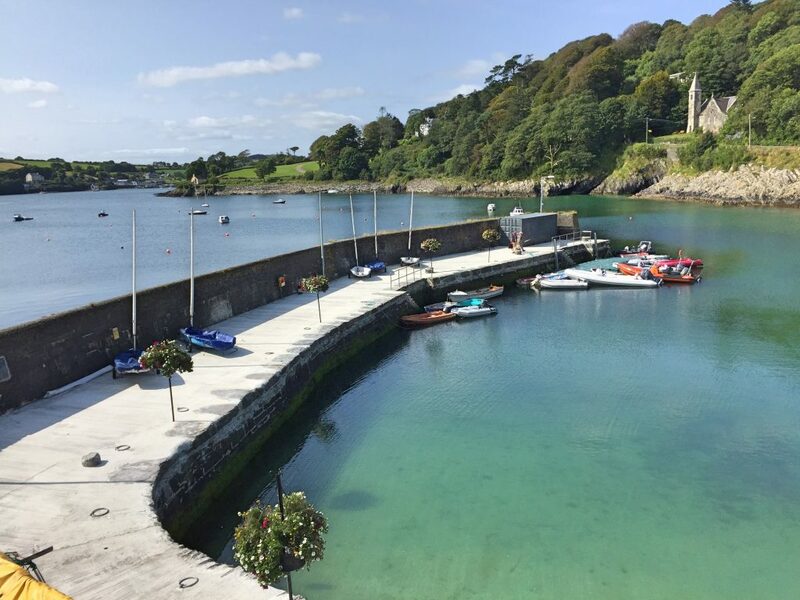 As you pass Eve, the beautiful inner harbour opens up, with views to the village of Glandore, and on the bluff to the West, three imposing Edwardian residences built when Glandore was known as the “Irish Riviera”. In front of you is McCarthy’s castle overlooking the harbour, and the charming Kilfaughnabeg Church, which is open to the public and well worth a visit. Glandore village is centered on the ‘terrace’ overlooking the estuary, and there are four great pubs, three of which are also excellent restaurants, all facing onto the sea. The terrace makes a natural grandstand for watching the racing in the harbour, and the racing normally starts and finishes immediately below the terrace. Ten minutes after you have picked up your mooring and furled your sails, you can be enjoying a well-earned pint. 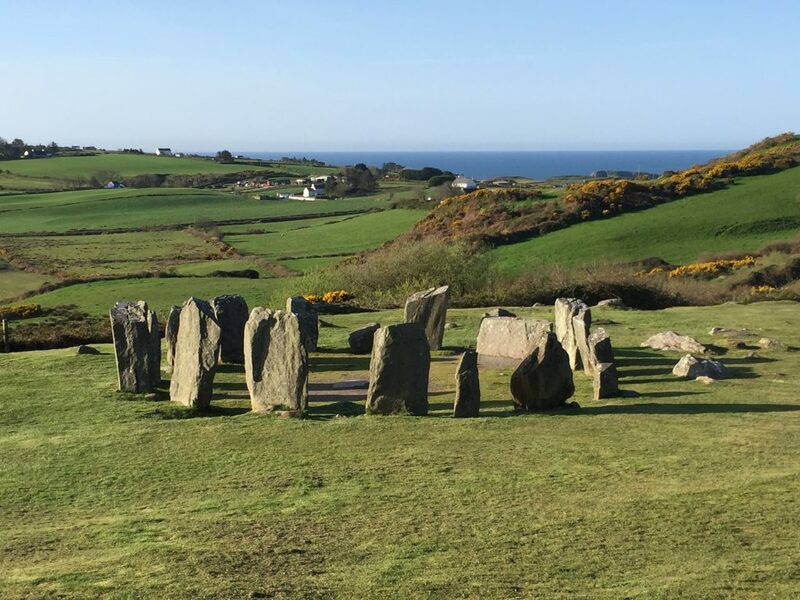 For anyone with time to spend away from sailing, there are lovely walks around the estuary, and the famous Drombeg Stones (the best stone circle in West Cork) is within walking distance of the harbour. The village of Union Hall is just across the estuary, and whale watching, sea angling and kayaking can all be found there, as well as several good pubs, a supermarket, and a lovely coffee shop. There are lots of B and B’s in the area, and very good quality rental apartments, see the list of accommodation on the GHYC’s webpage.